“Look! It’s a large lion.” That’s right it’s a picture of a large lion in an alphabet frame. Lots of l’s to find – 12 in the frame (three on each side) and three in the sentences. Keep your eyes open. 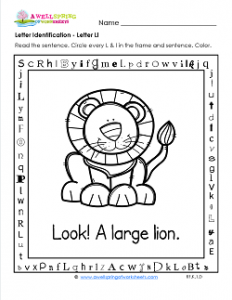 If the letters are too small next to that large lion try using a magnifying glass to make them bigger. That would be too much fun! You might even spot, quite by accident, the hidden sight word “me” in the top part of the frame. Guess what? I just noticed there are two other sight words in the top of the frame, too – “by” and “if”. Wonder if your kids will spot them, too. Have a happy time coloring the friendly fella.